The SACSC Footprint Marketing Awards recognise exceptional shopping centre marketing, innovation, creative achievements, with economic success and excellent customer service. This year, 35 awards were presented in total, of which eight were gold awards. All Gold SACSC Footprint Marketing Awards are automatically entered into the International Council of Shopping Centres’ Solal Awards. 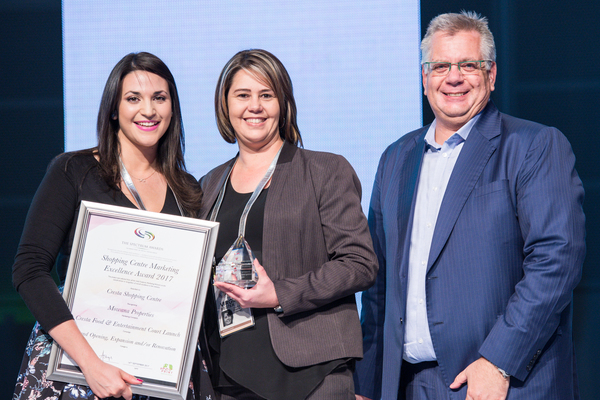 The newly renovated Cresta Shopping Centre claimed the coveted Spectrum Award this year for its Food and Entertainment Court Launch in the Grand opening, Expansion and or Renovation category. This super-regional mall that now boasts over 260 stores, owned by Pareto Limited won a Gold Footprint Award to qualify as a finalist for the Spectrum Award. The shopping centre managed by Mowana Properties, focused on the launch of the newly-built food and entertainment court that saw uniquely implemented marketing techniques which was further highlighted by the appearance of the renowned Master Chef judges. The Spectrum Award pays tribute to exceptional innovation, creativity and vision across all disciplines and sectors in the South African retail industry. Amanda Stops, Chief Executive Officer for the SACSC said she was impressed with this year’s entries. “Extraordinary innovations and concepts made up the exciting number and quality of entries this year. These entries showcased uncanny flair, detail and exceptional customer service. Each year, the Footprint Award entries get bigger and better and I am already looking forward to next year,” she says.